Alumni Football USA came to Maryville, TN this year to host a football game between county high school rivals Heritage and William Blount. There was, however, one big twist: the game was to be played by alumni of each school. Full contact, full pads, slobberknockin' football. Auto Solutions being host to alumnus of the schools, you can imagine the trash talking as soon as the game was confirmed. 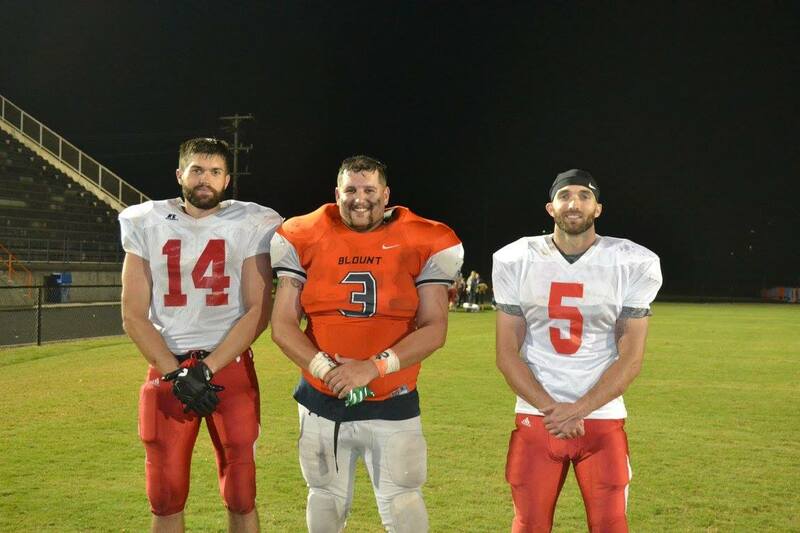 Three members of our team elected to play - Adam suited up at Fullback and Tight End for William Blount, while Bryan and Josh lined up at Quarterback and Wide Receiver for Heritage, respectively. William Blount won the game 22-8 and all came home unscathed, albeit immobile. They say the soreness is unbearable. While these guys aren't necessarily spring chickens (all around 30 years of age) they were among the average age of participants. Heritage had a player from the class of 1979! And two more played from the class of '86. Rumor has it a rematch is in the works for next year. In the meantime, Adam can walk around the office with his head held high knowing he was the captain of the winning team, as well as being voted MVP! Below is a picture of them. Congratulations men!